Bolivia’s guide to Lonely Planet advised that we ask several people when asking for directions. It went on to explain that in wanting so much to be helpful, locals will give you directions even if they have no idea where something is. The Patagonian highway network consists of only a handful of roads (some of them paved); the Wicked Van said it would be impossible to get lost. Challenge accepted. 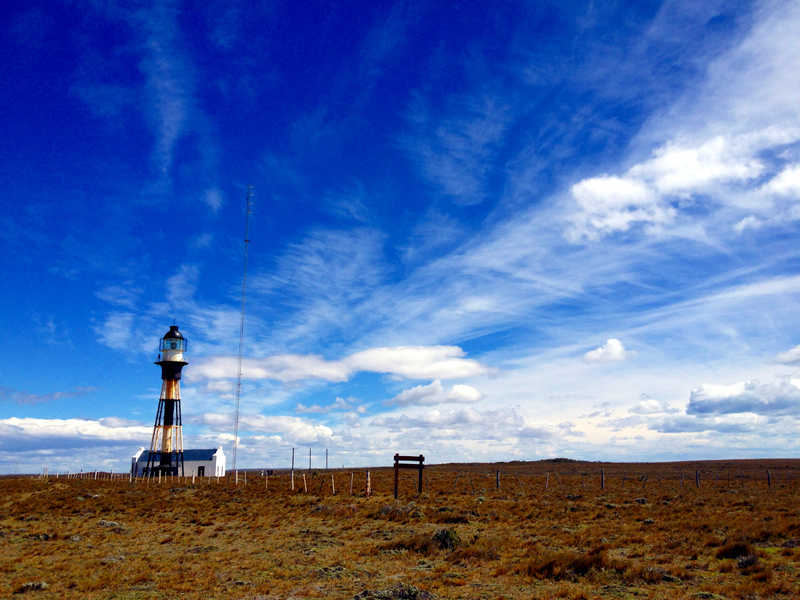 Fortunately, I remembered the advice from Bolivia – 4 helpful people later, we found the road to El Calafate. Each town meant opportunity to replenish our food, gas and possibly even a shower. El Calafate has a tourist street where we admired the bakeries and available WIFI, only to find the grocery store was closed for a holiday. This meant dinner would be more lentils and rice because we had to finish all our vegetables before crossing the border earlier that day. 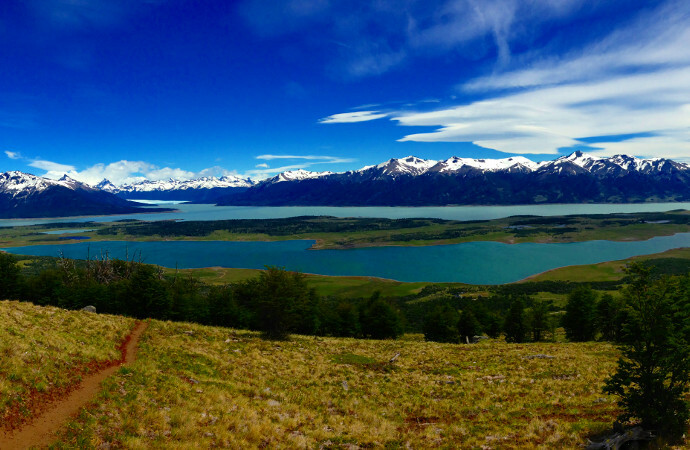 A small trail outside El Calafate, Cerro Cristal, led us to viewpoints overlooking glacial Lago Roca. 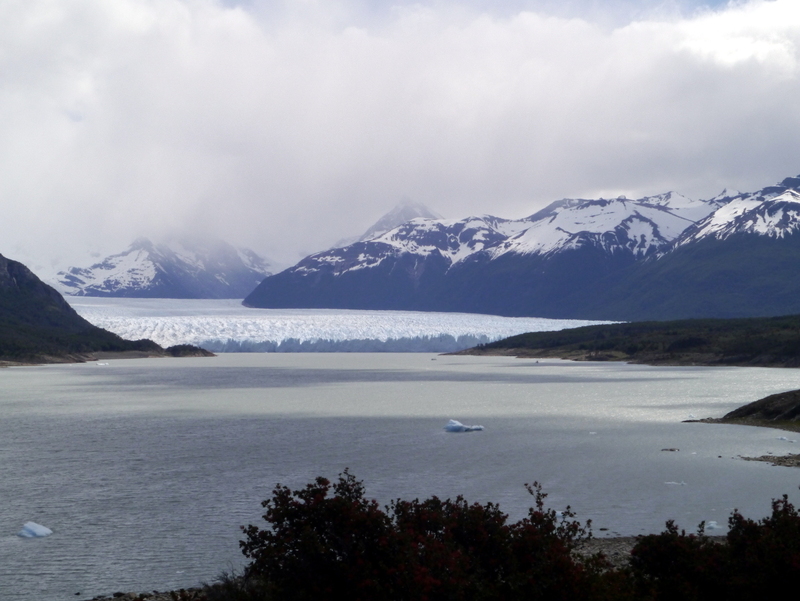 Strong winds menacing, we enjoyed the view mid-mountain to admire the grandeur of Perito Moreno Glacier before getting a closer view. 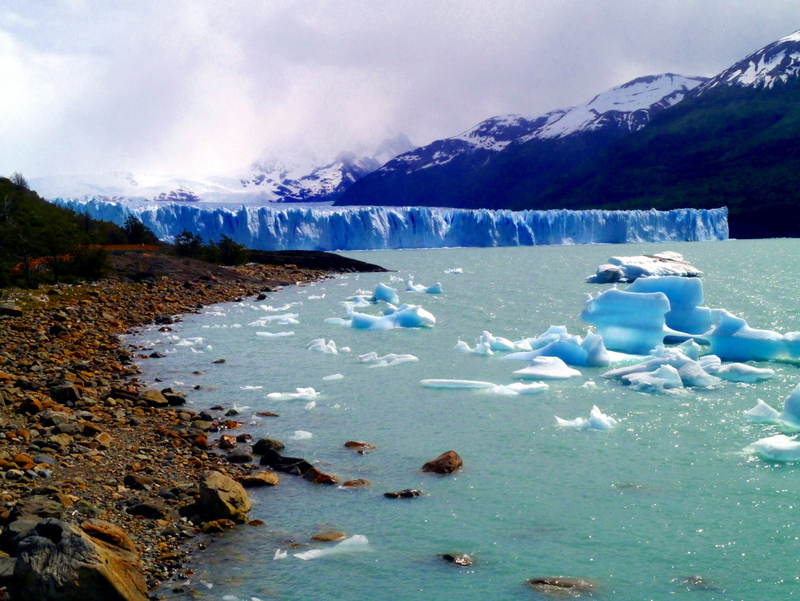 We waited until the afternoon visit to Parque los Glaciers, hoping that the sun’s heat throughout the day would allow us to witness large chunks of the Moreno Glacier falling into Lago Argentino and the Canal de los Tempanos. The well-maintained walkway led us around the glacial lake before presenting an up-close view of Moreno Glacier. Its edge drops steeply into the lake, leaving little icebergs floating along the surface. We waited for nearly half an hour as little pieces crumble off before a huge chunk sheared off, thundering down into the water. Each time we came across a body of water: 1. I had to touch it to see how cold it was (the glacial lake was unsurprisingly glacial) 2. ask Matt how much we would have to pay him in order to swim for thirty seconds ($2000 in this instance). How often can you say you’ve thrown a piece of glacier/iceberg? 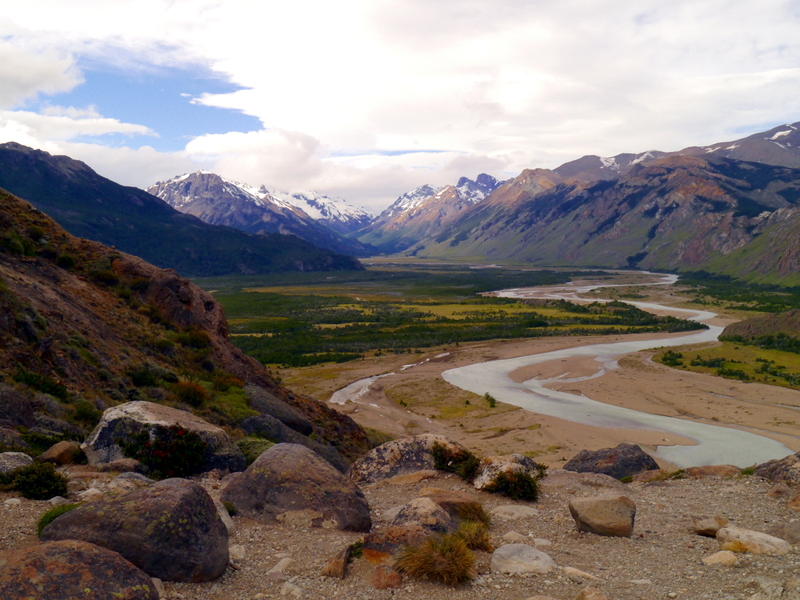 The next day, we drove to El Chalten to explore the Fitz Roy Range. The first day’s tropical-storm grade winds kept us off the longer trails, so we settled for the 1km hike to a waterfall before wandering around town. 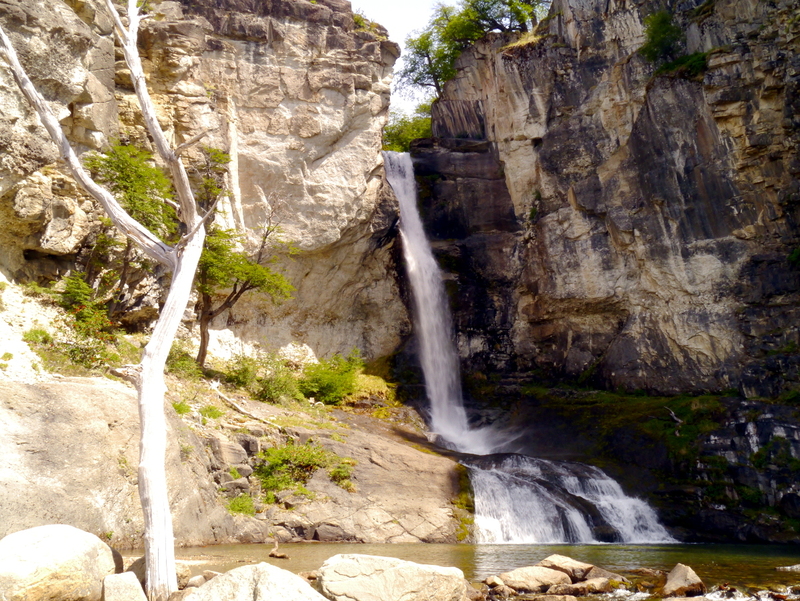 The waterfall was magnificent, and in our attempt to stay somewhat fit to offset the hours sitting in the van, we started doing push-ups/planks/sit-ups in nature. We were greeted by many stares, and even a comment on how typical American our behavior was (is that really a thing the US is known for?). As Rose and I salsa-ed around the grocery aisles, the butcher told us about the salsa/merengue and milongas (event where tango is danced) around town. Rose, one of the US’s best tango dancers, was thrilled to hear there would be dancing for her in Patagonia! What a bonus to find in this small town founded only in 1985 to secure the disputed border with Chile, today it’s used to as the trekking and rock climbing base camp for Mt. 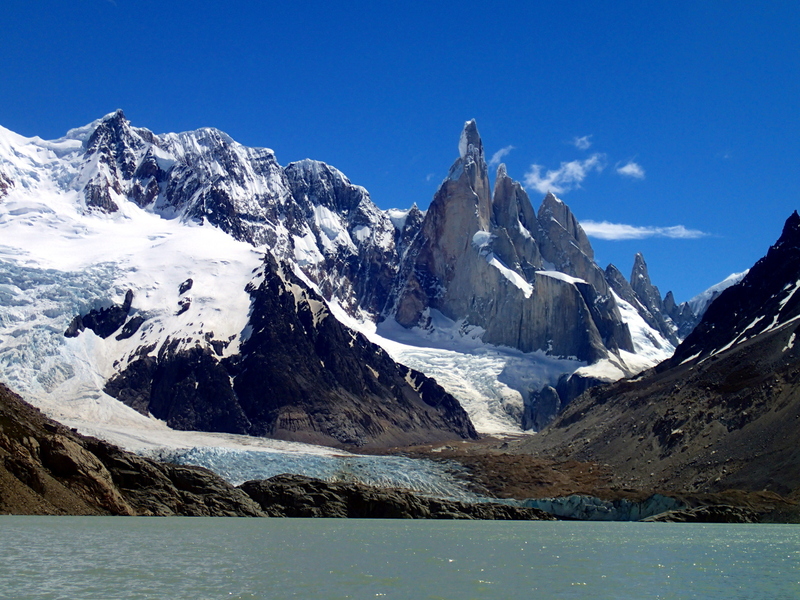 Fitz Roy and Cerro Torres. 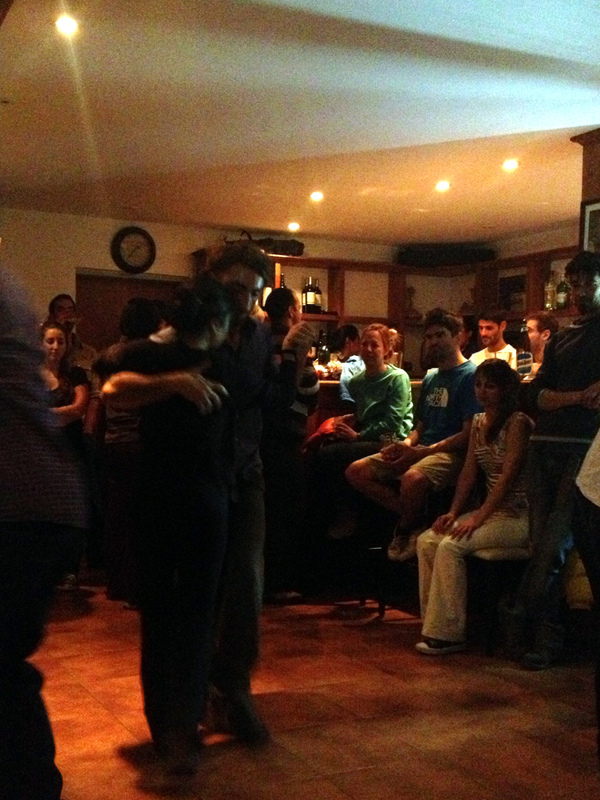 At 9PM, Matt, Rose (for moral support) and I arrived to the bar for a free tango lesson. The instructor condensed 4+ years of skills into a one-hour class (30 people scooting around a small space), but with Rose’s help, Matt and I were able to walk around in a straight line. Now, time for the milonga to begin! Locals started arriving after closing their shifts (around 11:30PM) as the novices cleared the way for more experienced dancers. After taking the better part of an hour to survey the landscape, as each tango community has their own etiquette, Rose learned from a local girl that it was acceptable for girls to ask boys to dance. We would finally see Rose strut her stuff! The first song, nobody knew how amazingly well she danced, but after a couple songs, the entire milonga stopped to watch Rose glide effortlessly and amazed by her exceptionally high kicks. All the Argentinians were on the sidelines watching her and greeted her with a roaring standing applause! Rose who had learned to tango in the humble Houston, Texas had won the hearts and admiration of all the Argentinians at the bar! 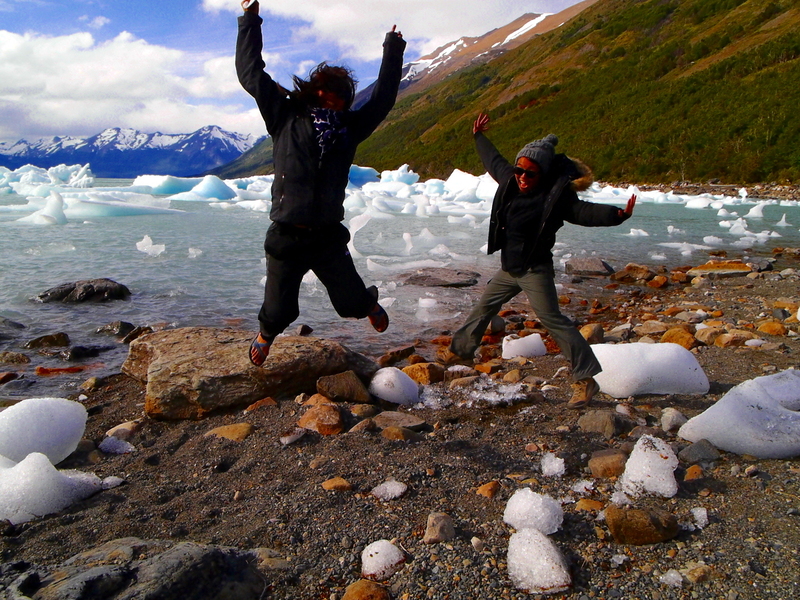 After all that excitement, we woke up early the next day to hike towards Laguna Torre and Mirador Cerro Torre. In contrast to the steep Torres del Paine, the terrain in Fitz Roy seemed much gentler as we headed towards the big glacial lake. The next day, we took a longer route, headed towards Luguna de los Tres. 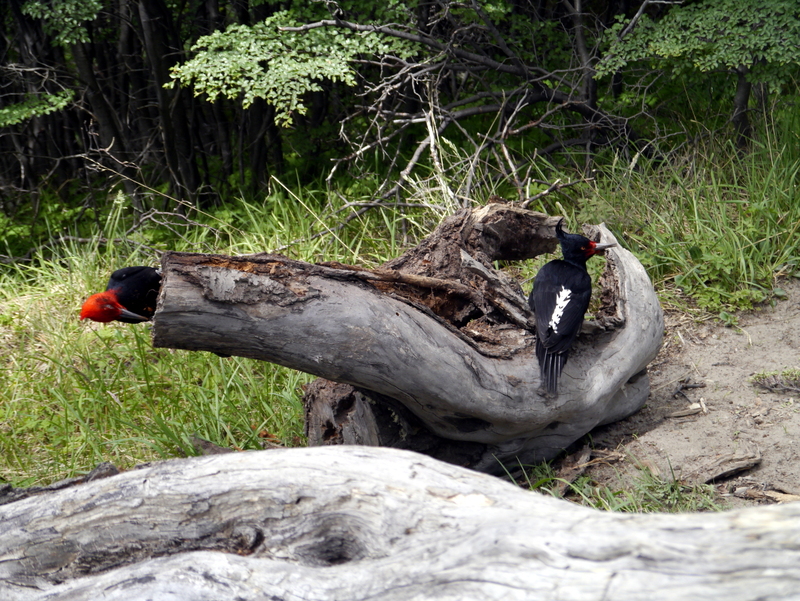 Along the way, we watched two woodpeckers destroy an old log in search for food. We felt joy in their victories, as they hit the jackpot with a juicy, white grub. I was glad to have Rose and Matt there to take the 30-minutes to enjoy this scene, as I usually plow through hikes, with the destination in mind. 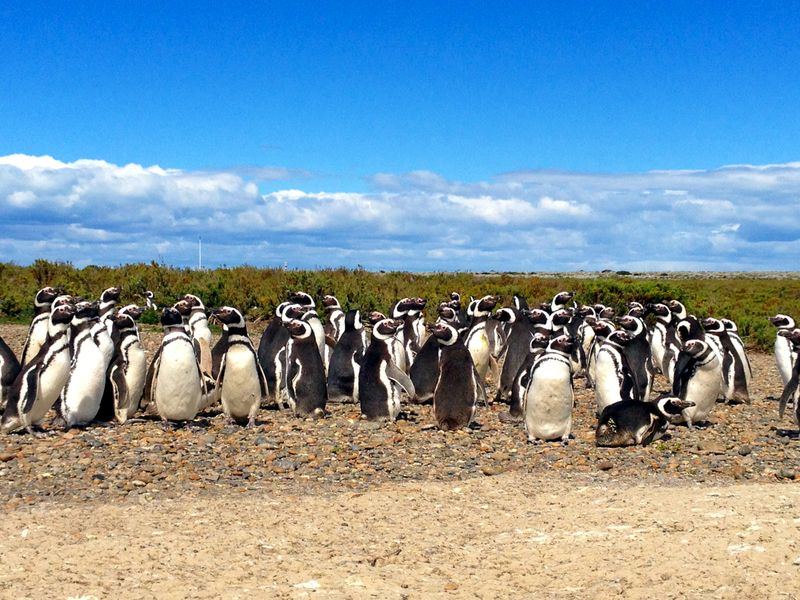 True to form, every third day seemed to be a windy one, so we headed south to Cape Virgenes for – PENGUINS! 120km doesn’t seem very far, but the road leading from the big town of Rio Gallegos to penguins was a MarioKart maze full of potholes and turtle shells. Three hours later, we were nearly there! We camped 10 minutes from the entrance; the park rangers were surprised to see us there so early because the road conditions are so poor that they only receive about 3 cars a day. The rangers described the penguins we would see (Magellanic) and shared their maté (Argentinian tea blend that has its own elaborate culture1) with us. In my imagination, penguins slide on their bellies over slicks of ice and withstand subzero temperatures to tend after their one egg (too much March of the Penguins). 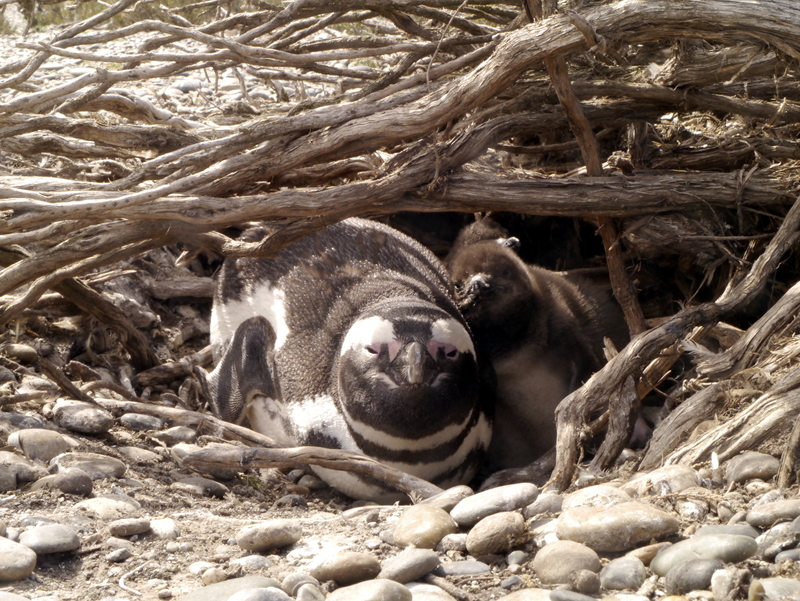 The penguins of Cape Virgenes waddled along a pebbled scrubland and built shallow nests under small shrubs. There was a penguin highway leading from the nests to the beach. They would march towards the water, taking on the waves chest-first until they were deep enough to swim. The mothers were protecting their nests, so we were able to get very close to them (we probably could have grabbed one to take home, honestly). Baby penguins are grey tufts of fuzz, snuggled with their siblings under the mom. If present, the (presumably) father penguin would stand next to the nest and wag his head at us. I assume he thought it was a menacing, aggressive posture but I found it endearing more than anything. 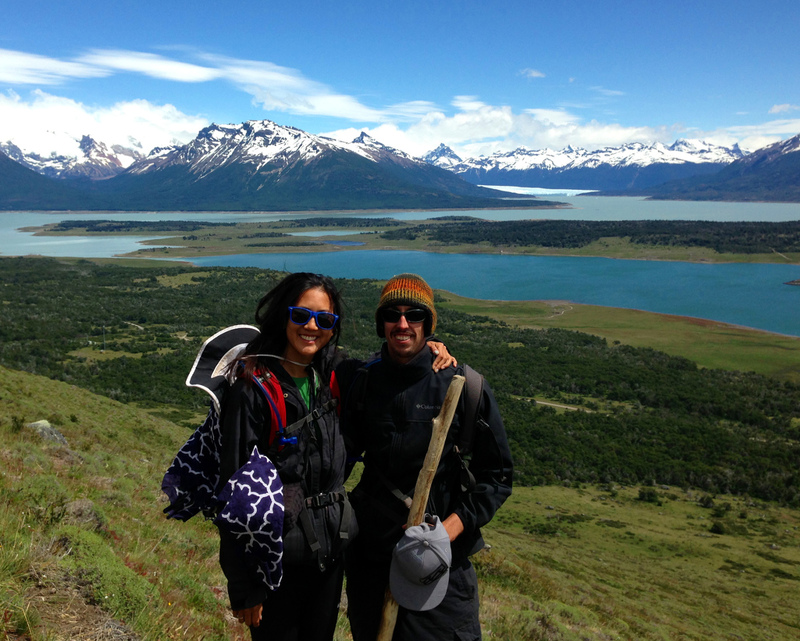 Back out three hours down the road, we headed towards the Chilean border and the ferry across the Straights of Magellan into Tierra del Fuego, the Land of Fire. We would be at the end of the world! Another great narrative – I always look forward to the next chapter! The photos really help visualize what it’s like to actually be there.